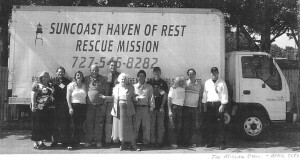 About Suncoast Haven of Rest Rescue Mission. The Suncoast Haven of Rest Rescue Mission was established 25 years ago in 1988 in Pinellas Park, Florida as a 501©(3) nonprofit corporation, and we continue to serve all of Pinellas County from this central location. Our campus of hard-working staff and happy volunteers multi-task in serving the needy public as a food pantry, a food bank, a Day Center, a rehabilitation center, and a church. 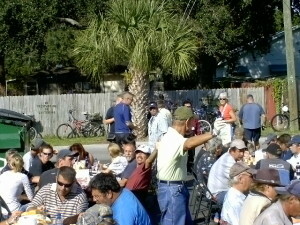 The doors to our Rescue Mission are always open seven days a week to the poor and needy. Our resident volunteer staff consists of formerly homeless men and women who have officially entered into our drug and alcohol free Ministerial Volunteers In Training program for rehabilitation (tearing down the old) and ministerial training (building up the new), and we also receive working assistance from many warm-hearted Christian men and women volunteers, and from hundreds of Community Service workers. 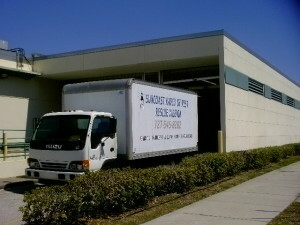 Together, with compassion, sincerity, and the loving understanding of God, we provide free boxes of groceries, donated clothing, and pre-owned toys to tens of thousands of, computer registered domiciled (they have apartments or homes) but impoverished families of men, women, and little children living throughout Pinellas County. Altogether, with the indispensable aid of our five trucks and crews, we are this year currently collecting and distributing an average of 187,164 pounds of food (93 tons) per month, or 124,776 meals and meal equivalencies per month to the poor residents and homeless citizens of this County. In addition to this, we are presently catering 7,896 delicious well-balanced hot meals per month (picking up the food, preparing, transporting, and serving it)to approved county-wide homeless shelters. Additionally, there are 171 other needy non-profit organizations in Pinellas County who receive bulk foods from our Rescue Mission, such as Retarded and Crippled Children organizations, Veteran’s Clubs, churches, retirement homes, hospices, Deaf persons Homes, various ministries, etc., etc. Our Day Center serves thousands of impoverished but still domiciled families (they have homes, apartments or trailers etc.) who are hovering upon the sharp edge of homelessness and in real-life danger of falling over the edge into dark depression accompanied by great despair. The food distributed (demand) this year represents a 300% increase over the same period the previous year. That is a pretty darn good economic indicator of what is really happening not only in Pinellas County, but also throughout the towns, cities, and villages of America. 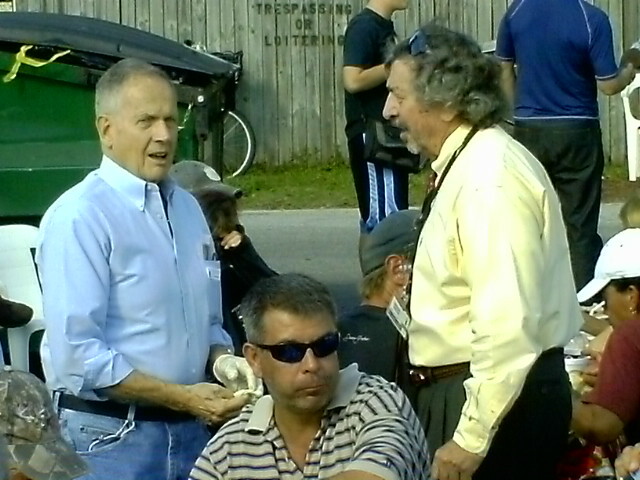 But with your gracious help WE CAN MAKE A DIFFERENCE; we can continue to spiritually and physically serve the thousands of hungry men, women, and little children living in Pinellas County, and whosoever else may be in need to the very best of our abilities. We Are Entirely Faith Based And Rely Totally On Your Gifts And Donations. Since our inception in 1988, over 5,000 persons have received Jesus Christ as their Lord and Savior through the wonderful sacrificial ministerial efforts of our staff and volunteers. Our Rescue Mission is a faith-based organization, hence donor funded, and our immediate needs are to secure enough monies sufficient to overcome a steep economy-driven decrease in our regular monthly donations. May you be eternally blessed with the forthcoming joyous event of our Lord’s soon return. Thank you Lord. And thank you for your kind attention. God bless you.